In the introduction to Ursula Prunster’s 1982 book celebrating the Golden anniversary of the Sydney Harbour Bridge, Edmund Capon remarked that “the Harbour Bridge may not yet have been assaulted by King Kong but it has been immortalized […] by artists in a range of mediums”, an observation that suggested that the Bridge had not featured as a centrally locative element in Australian film to the extent that the Empire State Building did in the 1933 movie. (1) While it is true that King Kong had not ‘assaulted’ the Bridge as such, the comment carried with it a suggestion that only cinematic images of the Bridge produced by the Hollywood studio system were capable of imparting cultural significance, and also implied that it had not assumed a central aspect in any Australian films. Similarly, Peter Spearitt writing in the same year suggested that “the bridge has fared better in paintings and still photos than on film, though it is of course featured as background in a number of films”, a point he illustrated by referring to the Ken G. Hall film, The Squatter’s Daughter (1933), without taking time to contemplate that the Bridge may have possessed some narrative significance within that film. (2) Both statements undervalued the extent to which the Bridge has been used in Australian film, and also failed to acknowledge the variety and complexity of images of the Bridge that filmmakers have created – images that go beyond merely serving as background. The Sydney Harbour Bridge had already begun to attract the imagination of filmmakers prior to its completion, and to this day continues to draw filmmakers towards it, in a way no other Australian architectural structure has consistently managed to do. (3) The continuous attraction of filmmakers over such an extended period has left a cinematic record that allows unique insights to be gained into how the Bridge was represented, from its earliest beginnings through to the Golden anniversary of its opening. (4) The complexity of meanings which have been generated around the Sydney Harbour Bridge are as apparent in film as they are in other mediums, and yet they differ, for entirely new meanings are generated due to the kinetic nature of the medium and the ability of film to represent the ways in which people interact with their physical environment. By examining some of the cinematic images of the Bridge up to the golden anniversary celebrations in 1982, I want to illustrate that not only is there a rich history of cinematic dialogue that has developed around the Bridge since its construction, but that very dialogue can act as an entry-point into discussions of modernity, place-making and the shifting basis of white Australian identity that cinematic representations were able to evoke and explore in complex ways. Although there is an abundance of films from 1982 onwards that have also used the Bridge to develop their mise en scène, ranging from Mad Max Beyond Thunderdome (George Miller and George Ogilvie, 1985) through to Crocodile Dundee (Peter Faiman, 1986) and Looking For Alibrandi (Kate Woods, 2000), to name but a few, by restricting the study to this specific time frame I hope to illustrate the blind spot that historians have had towards filmic images of the Bridge (and still do to a degree), by presenting a selection of the many films that existed in 1982 that had featured the Bridge in some format. (5) The timeframe of the study also works in neatly with the emergence of industrial modernism in Australia in the late 1920s (which the Bridge came to symbolise) through to the emergence of post-modernist movements in arts circles, as well as in academic institutions in the early 1980s. As the Bridge quickly established itself as a symbol of the nation, it is useful to examine how images of the Bridge in film were used to explore social change in Australian society in this period, and to illustrate how the symbol of urban Australia came to be a contested site as the notion of Australian national identity (barely four decades old in a political sense) began to fracture in the post-war boom years of the 1950s and ’60s and into the ’70s, With the development of the Australian feature film revival in the late ’60s predicated on showing Australians familiar landscapes in a celluloid form, it is not surprising that filmmakers turned to the Sydney Harbour Bridge to examine the basis of Australian identity and reflect it back to their audience. As the polysemous qualities of the Bridge were made more overt in this period, and marginalised sections of the Australian populace began to be increasingly associated with the Bridge in film, images of it can offer a unique window into the cultural debates of the time. The absence of any sustained analysis of cinematic images of the Bridge for the 50th anniversary celebrations reflected both a bias towards film by cultural historians, as well as registering film historians’ pre-occupation with the Australian landscape, rather than any lack of treatment by filmmakers. Ross Gibson has argued that so many filmmakers have come under the spell of the spirit of the land because “the land has become the structural centre of the nation’s myths of belonging” (6) and yet he also argues that all land outside the city limits signifies homelessness. (7) While the bush has been seen to be a dominant setting for Australian films, the urban landscape has had an equally prominent role, whether it has been a small part delineating what is ‘non-bush’ in primarily rural-based films, or acting as the dominant setting in the many city films that have been made from the earliest days of Australian cinema. From early during its construction phase, the Bridge came to be associated as embodying both a Sydneyesque and Australian urban identity. 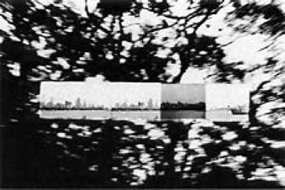 Therefore, examining the way it has been cinematically represented allows kinetic insights to be gained into the basis of that urban identity and how it was often juxtaposed against either the Australian bush or overseas urban centres such as New York, London or Paris. Despite the academic reluctance to examine filmic images of the Bridge, the fascination with exploring the narrative and visual possibilities of the Bridge has seen filmmakers return to it repeatedly. An examination of the films from the 1930s onwards presents an opportunity to examine attitudes towards Australia’s first recognised architectural icon, and to highlight the ways in which the Bridge acted as a conduit for Australian identity to be explored, in a period where that identity was marked by a fluidity and changing perceptions of its character. Academics who have turned their attention to artistic representations of the Sydney Harbour Bridge, such as Ursula Prunster, Peter Spearitt and Tony Fry, have largely ignored the substantial body of film work which has included the Sydney Harbour Bridge, dismissing it as essentially irrelevant or just overlooking it as an element within the cinematic frame. Tony Fry acknowledges the Bridge has been used in film, though his discussions of artistic representations of the Bridge is largely confined to painters and photographers (8), and Ursula Prunster’s only discussion of filmic images is a brief mention of Paul Winkler’s 1973 Sydney Harbour Bridge. (9) In the decade prior to these observations, film scholarship in Australia had expanded substantially (for instance, the work of Eric Reade, Ina Bertrand, Ross Cooper and Andrew Pike, to name a few), and yet, despite the large steps that were taken in redressing gaps in Australian film history and film theory in the 1970s, a structure as iconic and recognisable as the Bridge could still be referred to as ‘background’ when it appeared in film. The ‘fleetingness’ of Bridge imagery in film as opposed to the spatial staticness of photography and painting, which invites the spectator to contemplate the image, may contribute to the bias towards these forms of representation, though this does not explain why film commentators themselves were reluctant to turn their gaze onto the architectural background. Certainly the majority of the films in the study period which featured the Sydney Harbour Bridge did so only briefly, some more briefly than others, though if brevity of appearance were a criteria for dismissing the importance of filmic images, most set details, not only architectural, would have to be discounted as serving no purpose except to fill up the screen. Why the Sydney Harbour Bridge suffered the same disregard is more puzzling as it has most often been filmed as a discrete object. Therefore, it has been brought far more into the foreground than other architectural elements. The idea that the architectural background in Australian film has served primarily or even solely as a backdrop, and has had an underdeveloped relationship with narrative structure, not only misunderstands the complexity of meanings and attitudes to the built environment, but also undervalues the role of mise en scène in film. The general lack of analysis of architectural imagery in Australian film reflects an attitude that the built environment contributes little to a film apart from creating a ‘background’ for character dialogue and movement to occur within and around. The architectural background in Australian cinema is generally poorly documented or understood, in that there has been a general lack of interest in examining locational architecture, an oversight that applies to cinematic set design, of which no major studies have been undertaken. Similarly, much cinematic commentary on the urban environment considers the city in generic terms and is reluctant to engage in analysis of discrete objects or collective streetscapes, preferring generalised statements that, whilst at times insightful, express only surface impressions that often obscure more complex understandings and meanings that architecture possesses and is able to bring into a film. The reluctance to ‘see’ the city reflects a bias by commentators who, in the search for authentic images of Australia, turned to the bush or the ‘outback’. Being architecturally dyslexic, they have tended to see the Australian city only in terms of representing derivative European and American landscapes. (10) Apart from failing to recognise the compositional distinctiveness of Australian architecture as well as its historical context, what the absence of a critical response to the built environment within film overlooks is that the built environment at all times is engaged in a dialogue with the director, with the cinematographer, with the sound technician and with the actors, and at any point in time is able to reflect within the parameters of the mediated environment, the complex relationships that exists between people and the way they experience their environment. Independent of a film, architecture possesses a range of meanings and interpretations which are formulated and discussed amongst architectural critics, historians and cultural commentators. Sometimes these meanings, when they are identified (or construed), can well up unexpectedly within a film, supplementing the intra-film dialogue as well as expanding the domain of the film to act as mediator with the past/present. By the time that the Sydney Harbour Bridge was unceremoniously opened by Captain De Groot on 19 March 1932, a sense of the mythological and symbolic properties of the Bridge had already begun to be explored and developed by a range of painters and photographers, captivated by the kinetic spectacle of the two arches edging towards each other. Although there were a number of documentaries made on the construction and opening of the Bridge, and these offer important insights into attitudes towards the Bridge, feature filmmakers did not express the same enthusiasm to film the Bridge during the construction period. The one exception was in one of the opening scenes in The Cheaters (Paulette McDonagh, 1930) where the Bridge was used to mark a passage of time spent in gaol by one of the main characters, Bill Marsh (Arthur Greenaway), through a ‘before’ shot of the unfinished bridge and an ‘after’ shot with the arches filled in. While the painters and the photographers tended to highlight the dramatic and stark visual qualities of the bridge, already in this scene certain characteristics of the cinematic representation of the Bridge are being established. One of these characteristics involves using the Bridge to represent the changing urban environment through a passage of time sequence. A similar but more sophisticated example of this occurs in The Squatter’s Daughter, where the old squatter, Clive Sherrington (John Warwick), sails into Sydney Harbour after being away in London for a number of years. Looking at the Bridge from the deck of the ocean liner he says to a friend “when I left here two years ago I never thought I would see that Bridge finished”, highlighting the changes in Australian society that occurred while he was away. As he stands on the deck of the ship he talks to his friend, about wool being the spirit of Australia; the camera meanwhile is trained on the Bridge the whole time he talks. It is clear in this shot that the Bridge (and its representation of industrialisation) is now starting to compete on a metonymic level with the sheep as a symbol of Australia. Within this scene not only are socio-economic changes encapsulated through the juxtaposition of competing national symbols, but a sophisticated sense of irony is introduced that marks many of the uses of the Bridge in film, an irony that is often absent from photography and painting from this period. Just as Sherrington cannot see that Australia is changing from its reliance on primary industries, for he looks at a ship out of the frame, the camera cannot in turn see his point and focuses instead on the Bridge, thereby setting up a counterposing dialogue. 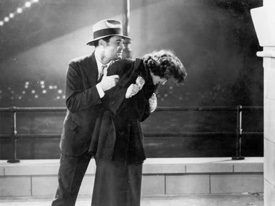 This sense of irony can also be seen in another Cinesound film from 1933, The Broken Melody (Ken G. Hall), in which a painted backdrop of the bridge (as opposed to the locationally filmed Bridge of the other films) features in several scenes. In the suicide scene where Ann Brady (Diane Du Crane) tries to kill herself by throwing herself into the Harbour (a scene which has a slight resonance to the Golden Gate scene in Alfred Hitchcock’s Vertigo 20 years later), the half-heartedness of the attempt at terminating her life is driven home by the fact she tries to do it from the bottom of the Bridge. Therefore, when Ann Brady is saved from a watery death by the hero, John Ainsworth (Lloyd Hughes), the Bridge stands in for an ironic symbol of hope rather than representing a disjunctive moment. Whilst the Bridge is given a slightly ironic treatment in the suicide scene, it is also the point when the two main characters first come into contact with the Bridge, rediscovering hope and beginning their climb out of an impoverished situation into which they have both fallen. Again, later in the film, when homeless, she co-habitates with John in a cinematic version of Happy Valley (a cheerful cave in the Domain with views over the Harbour), the Bridge visually terminates at one end of the cave like a rainbow coming to rest in the Domain. The unity of the nation and the connotation of social cohesion that the Bridge represented for many people in the Depression is nowhere more apparent than the scenes in the Domain, for, although they are down on their luck (it is set in the Depression and they are both unemployed), there are no signs of resentment or unemployed unrest. The Bridge holds out hope and opportunity, thereby keeping a lid on any simmering tensions. SANDY: Slopping paint on a bit of old iron. WORKMATE: Hey, what’s a bit of old iron. This is the Sydney Harbour Bridge, this is. SANDY: Well you can have it, mate. I’m going to look for something more exciting. Apart from registering the workmates civic pride in the new structure that had redefined the skyline of Sydney, and his recognition that the Bridge is something more than the sum of its physical components, the Bridge is used to symbolise Sandy’s decline as he rejects the path of redemption that the Bridge offers. Instead of atoning for his dastardly behaviour, Sandy searches for something ‘more exciting’, and from this point on we know that deterministically his fate is mapped out for him. Alone in the world, eventually he takes his own life at the end of the film. (11) Generally the films of the 1930s that utilised the Bridge as part of the mise en scène tended to highlight the idea that the Bridge functioned as a symbol of both class mobility and social cohesion, rather than the more negative messages that wore embedded in The Flying Doctor. Films made in Sydney in the 1930s began to acknowledge that the Bridge was taking on the mantle of a national symbol, which importantly for the white Australian population represented the first architectural work to gain a transcendent status both nationally and internationally as an icon that could reflect a visual belonging to the land. (12) Sydney, which had long been recognised for its beautiful Harbour (which its citizens had long appreciated, but had not created), now had a structure that in one and the same breath subjugated and enhanced the Harbour, as well as introducing an architectural component that was able to project an image of Sydney. As such, several film from the 1930s, including The Broken Melody and It Isn’t Done (Ken G. Hall, 1937), juxtaposed the Bridge against nationalist symbols in the ‘old country’, such as London Bridge. The re-engagement with the Bridge in feature film in the 1950s was initiated by Cecil Holmes in “The City”, the third section of his 1957 portmanteau film, Three in One. “The City” is a film about a couple, Kathie (Joan Lander) and Ted (Brian Vicary), who, after spending a day at work (Kathie in a boutique and Ted at a car manufacturing plant), go for a night out on the town in the city of Sydney. From the first frame, a tracking shot along Dawes Point, we are left in no doubt that Sydney is signified by the Bridge. The Bridge has become so familiar that seeing even a glimpse of it across the suburban landscape (as in the opening sequence) informs us that we are in a city that is readily identifiable. But rather than leaving the Bridge stranded solely as a locational marker, Holmes begins to explore the metaphoric properties of the Bridge in this short but symbolically rich film. The way that the film establishes the Bridge as a central element is achieved by the early shots which at first appear as if they are primarily locational shots. As the film develops and Kathy and Ted wander through the city, the Bridge lurks in the background, drawing the two closer towards it. Eventually, they end up underneath the Bridge in Dawes Point where they have an argument. At this point, one senses that Holmes’ use of the Bridge is more complex than merely acting as a locational marker, and that what he is interested in is examining what lies under the surface of the symbol. Following their fight, Kathie becomes distraught and runs underneath the Bridge, away from Ted. The handheld shots picks out the tangled trusses of the Bridge and amplify the noise of a train passing overhead to convey Kathie’s traumatised state. Ted, on the other hand, opts to catch a ferry over to Luna Park, and, moping on the deck of the ferry, watches the Bridge looming overhead, the only aural intrusion is the sound of waves lapping against the boat. At the dramatic point where they are close to the Bridge, and it presents them with a symbolic suggestion of unity, Ted and Kathie instead go in different directions and experience the Bridge in contrasting ways. Kathie experiences the harsh realities of a woman alone in a big city, having to fend off two men who make unwanted advances to her, while Ted wanders dejectedly through the smiling faces at Luna Park. Whilst they are re-united at the end of the film, it is not insignificant that they meet in the uni-linear space of the railway station away from the more spatially and symbolically ambiguous Bridge. Over the following decade a spate of overseas productions (or “visitors films”, as Graham Shirley and Brian Adams call them) used the Bridge with varying degrees of sophistication and attention to the cinematic possibilities that it offered. Although the overseas productions raised the hackles of some commentators for their inability to convey an “adequate impression of national identity” (16), cultural residues still infused the films, often no more patently than in the use of the architectural background. The perceptive attention paid to the architectural aspects in a film like Ealing Studios’ The Siege of Pinchgut (Harry Watt) becomes apparent when compared to the more picturesque and perfunctory Summer of The Seventeenth Doll (Leslie Norman, 1959). (17) While both were foreign productions, and both used a surfeit of Bridge shots, The Siege of Pinchgut manages to justify the at times over-zealous use of the Bridge, by tying it into a sub-textual dialogue on modernity and the city under siege from urban development. The dialogue that is developed within the film is attuned to fears that began to emerge regarding large-scale urban redevelopment in Sydney in this period, fears that would culminate in the Builders Labourers Federation Green Bans and resident-action-group protests a decade later. (18) The film also anchors the symbolic Bridge to the personal dilemmas of the central characters in the film, a band of escaped convicts, who find they have no where to turn once the police marksmen swarm over the Bridge, and lie waiting to pick off the escapees who are trapped on Pinchgut Island. The subjugation of the Bridge by forces of the State is an interesting political subtext in the context of the Cold War machinations directed at the left spectrum of Australian politics, especially as the issue of justice, a central theme of the film, is never satisfactorily addressed. Once the Bridge is under the control of the State, there seems to be no chance of justice for the appellant Matt Kirk (Aldo Ray), whether he warrants it or not. A film such as Summer of the Seventeenth Doll, on the other hand, tries its best to insert a shot of the Bridge into as many frames as possible, regardless of whether it is narratively significant at the time. Whilst the pathos of the disintegrating relationship of Roo (Ernest Borgnine), Olive (Anne Baxter), Barney (John Mills) and Pearl (Angela Lansbury) is neatly captured by the symbolism of the Bridge, the heavy-handed use of the Bridge dulls the poignant qualities that it could have had. The fact that the film should have been set in Carlton is perhaps best left for another article, though had it been set in Carlton, as the original play originally is, the cinematic treatment of the architectural landscape as somehow reflecting the crossroads that the characters have arrived at would possibly have been a more challenging task for the director Leslie Norman. Selling the film to an international market was made easier by setting the film in Sydney, due to its picturesque qualities, and the cinematic flexibility of the Harbour Bridge allowed Norman to relate the characters and their narrative situation to their physical environment in a fairly pre-digested way. This last point highlights not only a cinematic difference between the way Sydney and Melbourne are represented, it also informs us of the ways that the architecture is understood as representing the various cities. While Melbourne has traditionally been a cinematically amorphous city, Sydney has gravitated towards favouring the singular iconic reference point as a marker of the city, as well as exploring the ways these markers interrelate with one another. (19) The Bridge was the first of the city’s urban icons, and in many respects, apart from some competition over the years from the Opera House, Australia Square and Centrepoint, has remained as the pre-eminent cinematic image of Sydney, and the image through which Sydney has explored and elaborated on its identity. 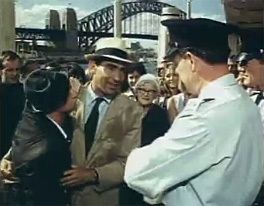 Following the release of The Siege of Pinchgut and Summer of the Seventeenth Doll, it would be another seven years before the Bridge surfaced again in an Australian film, this time in Michael Powell’s They’re a Weird Mob (1966) in a brief and fairly uninspired scene towards the end of the film. With the exception of Powell’s film, by the time that the Australian feature film production started to gather momentum in the late 1960s the Sydney Harbour Bridge (and the urban topography of Sydney for that matter) had been absent from the cinematic landscape for well over a decade. Within the space of the next decade and a half, the Bridge would appear in no less than 38 films compared to 11 films for the previous 35 years. The ‘revival’ of the Australian feature film industry, argued for by a wide range of writers and filmmakers during the 1950s and 1960s, was fostered within a milieu marked by a nationalist rhetoric that yearned to see an Australian feature film industry that could tell distinctly Australian stories and reflect upon familiar Australian landscapes. (20) With geo-political shifts in power in the aftermath of World War II, and Australian foreign policy shifts aligned towards supporting the United States, the basis of Australian identity became a politically charged issue from the 1950s onwards. (21) When the feature film ‘revival’ began to emerge in the late 1960s, production occurred in a period where the notions of national identity were in a state of flux, and like many Western countries in this period Australia was marked by social upheaval such as the organised opposition to the Vietnam War, the resurgence of a publicly political feminist movement, the emergence of a black-rights movement and a changing cultural matrix stemming from changes to post-war immigration policies. In this climate of cultural ferment during the late-1960s and into the ’70s, the Bridge became a contested site/sight as filmmakers explored the complexities of national and individual identity by focusing on the Bridge as a symbol of nation. It is not possible within the space of this article to reflect upon all the feature films made in this period that incorporated the Bridge within their script. Nonetheless, in choosing the following three films some of the more significant themes the Bridge represented can be illustrated. The first of these, Jim Sharman’s Shirley Thompson versus the Aliens (1972), is a significant film for a number of reasons. It showed for the first time a main character physically moving across the Bridge, in a scene towards the end of the film where Shirley (Jane Harders) capitulates to her madness/perceived madness and is seen running over the Bridge to the ‘aliens’ at Luna Park. Acting like a neural network, the Bridge allows Shirley move across into an altered reality – a state deemed madness by the society that ends up incarcerating her. The association of self-injurious or harmful actions with the Bridge was not novel, for Ann Brady in The Broken Melody attempted suicide in the shadow of the Bridge, but it was the first time that the Bridge aided and abetted in, and embodied this form of action. Although Shirley Thompson was not the first film to use a mediated reference to the Bridge, it was one of the first films to explore the complexities that could be gathered together in the mediated reference, in this case a large photo poster in the café that Shirley frequents with her friends. (22) In the café scene, a large photo poster of the Sydney Harbour Bridge adorns the wall above the counter. The vantage point from where the photo has been taken is from the North Shore near Luna Park, where the ‘aliens’ of the films title have ensconced themselves. The significance of where the photograph was taken is that visually the poster gains a panoptical quality in which the aliens are able to see through the poster into the café (or perhaps that is what Shirley imagines), and that Shirley is enticed towards the origins of the image. The image of the Bridge on the poster becomes destabilised in this sequence within the café, for not only is the Bridge seen through the lens of the movie camera, it is also seen through the lens of the photographer/alien and redefined as not a static image but one that represents an immobile gaze. It is as if the aliens are watching us as well. As the 1970s progressed, Australian cinema began to increasingly explore the notion of national identity, not only through films like Shirley Thompson, with its questioning of the cultural and social legacy of the Menzies years, but also in films such as Promised Woman (Tom Cowan, 1975) and The Golden Cage (Ayten Kuyululu, 1975) that examined aspects of the migrant experience in Australia. The Golden Cage used the Harbour Bridge in contrast to the Bosphorus and Galata Bridges in Istanbul, to tell a story of the lives of two Turkish men, Murat (Ilhan Kuylulu) and Ayhen (Sait Memisoglu), living in Sydney. Their mixed feelings towards living in Australia are expressed clearly in the ways that they both experience and construe the Harbour Bridge. Ayhen, the younger of the two, only ever sees the Bridge from a distance in both the scenes when he attempts suicide. The Bridge is somehow never physically grasped by him; it is always distant. When Ayhen attempts suicide the first time by jumping into the Harbour near Circular Quay, as he is pulled out of the water and is put into an ambulance he sees the Bridge through the window of the ambulance. Torn between two cultures (more so than Murat), he succeeds in killing himself at the end of the film when he leaps off a high-rise building in the CBD, the camera shifting from an image of the Bridge to rooftops in Istanbul, then back to the Bridge. Detached from the city, the Bridge almost draws him towards his death. Murat, a slightly older man, is more assured of his cultural identity. When he experiences the Bridge it is in the form of a physical engagement, as he walks along the Bridge after Ayhen’s first suicide attempt. Although he simultaneously reminisces about walking along the bustling Galata Bridge in Istanbul, as he walks alone across the Harbour towards North Sydney he is anchored to the Bridge, and returns to it from his thoughts. The destabilisation of the Anglo-Saxon hegemonic world-view and the tentative engagement in cultural dialogue is perhaps nowhere more sharply explored than in Peter Weir’s The Last Wave (1977). The narrative of The Last Wave circulates around a white lawyer, David Burton (Richard Chamberlain), who suffers an epistemological crisis when he comes into contact with a group of Kooris he is asked to defend on charges of murder. As his white, middle-class, rational world is increasingly called into question, Burton starts to unravel as he is drawn towards a spiritual world he thinks he glimpses. Although Jack Clancy interprets The Last Wave as punctuating our consciousness with two contemporary issues, the place of Aboriginal culture in a materialist, rationalist culture and a “physical and spiritual environment violated by that materialist, rationalist white culture” (24), I would argue that there is at least another issue that Weir examines in the film. This issue probes the foundation of rationalist thought through exploring the perceptual basis of architectural spaces in The Last Wave as they begin to dissolve around the edges, calling into question the basis of their solidity. (25) When David Burton is made aware that his epistemological world is built on shifting sands, it occurs during a meeting under the Bridge, when he is warned by one of the accused men, Chris Lee (David Gulpilil), of the dangers he faces. That the meeting occurs under the Bridge highlights the existential dilemma Burton faces, for, as his ordered world starts to crumble, the symbolism of the Bridge suggests he is faced with a choice to either disengage from a spiritual world he has stumbled into or face the destabilisation of his identity. Whilst on the one hand suggesting that there is an inseparable barrier between Aboriginal and white-Australian culture, it also suggests that the Bridge can act as a conduit between cultures, though once that conduit is opened up a two-way dialogue is an inevitable consequence. From the earliest cinematic images of the Bridge, it was clear that complex narratives were able to be drawn from the ‘coathanger’, as filmmakers began to explore the symbolic dimensions of Australia’s first architectural icon. The Bridge was both a subjugator of the landscape and its original inhabitants, as well as a symbol of social cohesion. It represented modernity, yet was not alienating in the way that modern architecture came to be viewed in the post-war period. It stood for a resurgent Sydney and yet it transcended State boundaries to represent the nation. Although the complexities that the Bridge was able to embody were apparent from the early 1930s, more often than not it stood in as a symbol of modernity and national unity. If one accepts Roland Barthes’ argument that all images are polysemous, but that “in every society various techniques are developed intended to fix the floating chain of signifieds in such a way as to counter the terror of uncertain signs” (26), it is possible to argue that the Bridge maintained a fairly stable (though not uncomplex) set of meanings up until the late 1950s, With the advent of the feature film revival of the early 1970s, the polysemous qualities of the Bridge were increasingly made apparent as filmmakers turned to the Bridge to explore issues of national identity at a time when the ‘Australian legend’ was under sustained attack and the cultural heterogeneity of the population was being increasingly recognised. As the Bridge became a contested zone in this period, the meanings which had remained relatively fixed began to float free, introducing the idea that national identity might just be a more complex notion than it had been imagined up until then. Edmund Capon, “Introduction”, in Ursula Prunster, The Sydney Harbour Bridge 1932-1982: A Golden Anniversary Celebration (Sydney: Angus & Robertson, n.p.n). Peter Spearitt, The Sydney Harbour Bridge (Sydney: Allen & Unwin, 1982), p. 96. The Sydney Opera House, though often conjoined with the Bridge, as well as featuring extensively in such films as Scobie Malone (Terry Ohlsson, 1975), Star Struck (Gillian Armstrong, 1982), One Night Stand (John Duigan, 1984) and Looking For Alibrandi (Kate Woods, 2000), has not managed to develop the cinematic profile that the Bridge has. This no doubt has some relation to the metaphorical plasticity of the Bridge and the ease to which it can adapt to serve different cinematic roles. 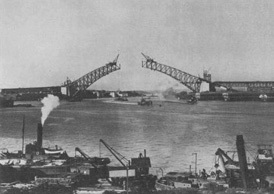 For early footage of the film, see the Harrington’s production, The Sydney Harbour Bridge (1932), that chronicles the building of the Bridge. Shot by Henri Mallard, the film, which runs for 69 minutes, is undoubtedly the best of the early documentary films on the Bridge. The Charmed Cup from 1929, a commercial for Bushells Tea, also feature interesting footage of the Bridge, in which it is referred to as “the stupendous Sydney North Shore Bridge”. With the 75th anniversary of the Bridge approaching, it is perhaps time to remedy this oversight. Ross Gibson, “Formative Landscapes”, in Scott Murray (Ed. ), Australian Cinema (Sydney: Allen & Unwin, 1994), p. 49. Tony Fry, Old World New Visions (Sydney: Hale & Ironmonger, 1989), pp. 109-131. Tom O’Regan in his book, Australian National Cinema 1996, when discussing city films (p. 210) says, “it has to be remembered that these city and town landscapes are not especially Australian in look”, claiming that here “the urban landscapes could be easily and readily European (English, German Dutch)”, though he does not state what an Australian city should look like apart from suggesting it needs to be bathed in sunshine. Although they are stylistically different films, there are similarities between this film and the 1969 film, You Can’t See ’round Corners (David Cahill), in that the Bridge offers a choice to the main characters to redeem their behaviour. But they both reject the chance to change and at the conclusion of the film they die. An interesting film in this respect is Beaumont Smith’s The Hayseeds (1933). When the Hayseed family visit Sydney from their bush homestead, they take in the sights of the city. While the Bridge features prominently in a number of scenes, it is not referred to directly. The architectural structure that is singled out for comment, instead, is the Post Office, which is pointed out as an urban landmark to Dad Hayseed (Cecil Kellaway) by their city friend, Mr Townleigh (Kenneth Brampton). Prunster notes that from World War II till the 1960s “it [the Bridge] receded from the public awareness and was absorbed into the general panorama” and “those who found the harbour a source of inspiration included it in their vistas but did not isolate it as a symbolic form”. Prunster, p. 15. The Sea Chase, a 1955 John Wayne-Lana Turner movie directed by the Australian-born (but Hollywood-based) director John Farrow, and set initially in Sydney, used stock footage of the Bridge to suggest the opening sequence was set in the city, but it contributed little to the film apart from acting as a locational marker. Graham Shirley and Brian Adams, Australian Cinema: The First Eight Years (Sydney: Angus and Robertson, 1983), p. 208. The script for The Siege of Pinchgut was written by the Australian director and producer Lee Robinson, with the assistance of lnman Hunter. Prior to the film being made, Sydney architect Harry Seidler had proposed a redevelopment scheme in an area of the North Shore around McMahons Point which would have seen an entire neighbourhood wiped out and replaced by tower-block developments. The scheme was vigorously opposed by residents in the area. The scenario in the film presents a similar potentially catastrophic event (the firing of a canon at a loaded ammunition ship), which would result in the devastation of Woolloomooloo and Potts Point, though it is averted at the last moment. Several years after Siege, The Rocks area, too, was faced with annihilation as the government held a competition to redevelop the entire suburb. The winning design by Col Madigan was predicated on bulldozing the suburb and building anew from a tabula rasa. For a discussion of representations of Melbourne in film, see Adrian Danks, “Don’t Rain On Ava Gardner Parade”, in Deb Verhoeven (Ed. ), Twin Peeks: Australian and New Zealand Feature Films (Melbourne: Damned Publishing, 1999), pp. 173-85. Writers such as Sylvia Lawson and T. M. Fitzgerald at the journal Nation were strong advocates of a national film industry, as were The Age film critic Colin Bennett and Michael Thornhill writing in Sydney. See R. White, Inventing Australia: Images and Identity 1688-1980 (Sydney: George Allen & Unwin, 1988), pp.158-71. Wake in Fright (Ted Kotcheff, 1971) has an interesting scene at the beginning of the film, with a mediated image (postcard) of the Bridge. The Adventures of Barry McKenzie (Bruce Beresford, 1972) also uses a photograph of the Bridge in the television studio scene where Barry (Barry Crocker) is interviewed on the Midnight Oil show. Tom Cowan’s Promised Woman is another film from this period that uses the Bridge to explore the migrant experience in Australia. Jack Clancy, “The Last Wave”, Cinema Papers, No. 15, 1978, p. 259. There are images throughout the film of architectural boundaries dissolving and being destabilised, from the first scene where hailstorms smash a window at the school to the surreal sequence towards the end where skyscrapers, shot in a late afternoon sun, appear to be burning up and are misshapen. Roland Barthes, “Rhetoric of the Image”, in Barthes, Image Music (London: Text Fontana Press, 1977), p. 38. Lennart Jacobsen is a Melbourne-based archivist.